There’s little doubt that Bethesda has become the primary reference point for modern Western RPGs. Between the Fallout (please, please, port Fallout 3) and the Elder Scrolls series they’ve steadily raised the bar for creating worlds that you can get lost in, usually in a good way. For the fans of Skyrim, though not hardly a new title, there was good reason to be both dumbstruck and skeptical almost a year ago when the first teaser commercial showed up and there was a glimpse of this grand and massive title running on the Nintendo Switch. The idea that it could not only run on a portable system but not be utterly hamstrung by its limitations in some way seemed almost preposterous. It’s officially time to give full credit where it is due, the people at Bethesda have now delivered back-to-back mini miracles, first delivering an impressive port of DOOM and now bringing the full and uncompromised massive world of Skyrim to the Switch. For the uninitiated, especially those familiar only with the open world aspects so lauded in Breath of the Wild, the first thing to understand is that regardless of how much exploration there was in the game Skyrim adds many, many more dimensions. The key difference in this world is choice, and the degree to which you are able to choose your own path. Not only can you venture out in any direction and try to uncover every nook and cranny of the map, but how you do it and who you’ll become over the course of those travels is also left to your instincts and inclinations. Will you aspire to be noble, give in to your more base instincts, or simply be opportunistic and go with whatever suits you at the time? At a higher level these choices won’t just influence you immediately but can have effects further into the game in terms of who will associate with you or opportunities that may present themselves. In particular there are powerful groups and organizations you may want to join up with, and in many cases to get on their radar it doesn’t pay to go down the middle, you’ll generally want to consistently go with the righteous or the unsavory paths. 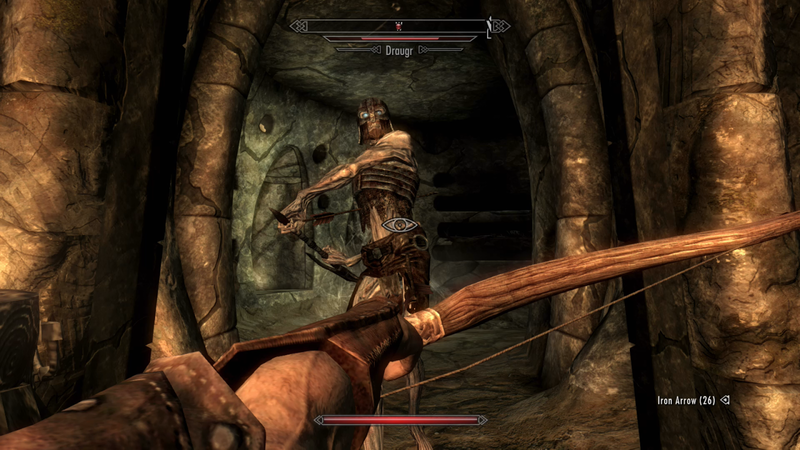 When you add this to the degree of player agency in terms of which discipline you’ll choose for fighting, whether as a magic user, archer, or master of one or two-handed weapons, and then proficiencies in skills like crafting, pickpocketing, lockpicking, or enhancing weapons and much more it can be a bit overwhelming. 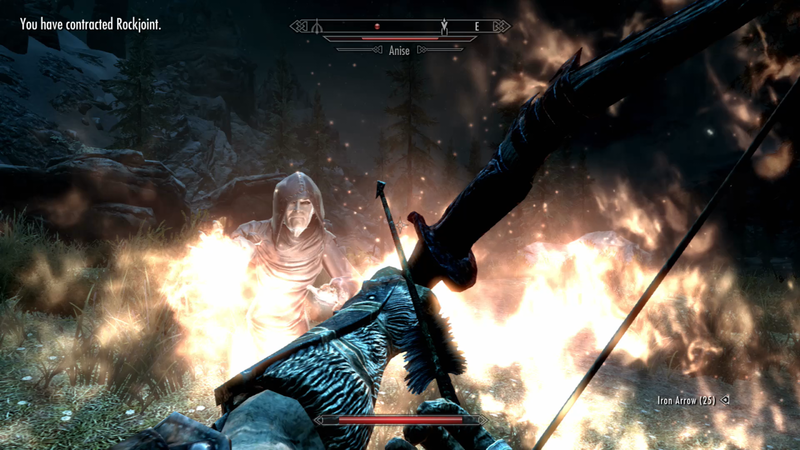 With all of this in mind Skyrim has a tendency to be less about the destination and much more about the journey, sometimes to the point that you’ll find people who’ve played the game for over a hundred hours without substantially advancing the core story. The joy in Skyrim tends to be more about the rabbit holes you’ll find, and how far you choose to go down them. You may randomly encounter someone in trouble or a place in your travels where your engagement is brief, limited to a fight or an exchange. There are, however, many cases where the people or groups that you’ll meet or hear about will require some substantial investment to first find them, then to gain their trust and become one of their organization, and then sometimes to help the group progress even further. It is often these experiences that make the game the most rich and memorable and yet, as I’d said, they don’t usually concern the game’s primary story at all. What most of Bethesda’s games risk with this common thread is that people can exhaust themselves or become satisfied with the overall experience and put it to bed before they see the end of the story. But, the beauty of games this rich is that doesn’t need to imply they’ve necessarily missed out since the realm has many stories to tell. The primary storyline just happens to be the one that is most fleshed out, but there are others that are nonetheless fascinating in their own right for you to discover whether on your first playthrough or your second, third, or fourth. As with my review of DOOM before it you’ll notice that to this point I haven’t brought up the Switch itself in regards to the game and that’s for good reason. Aside from some unique features it brings to the game in the form of some Amiibo support (which awaits you roughly mid-game in a prominent area), motion controls that you may enjoy or not care for, and the ability to take the game anywhere there’s not a lot to say. The reason for that is in this equation the Switch only seems to have pluses and no discernable minuses. The conversion of Skyrim is, for all practical purposes, a flawless one from the time I’ve spent in the game. The details are crisp, the performance has no signs of hiccups or slowdown, and despite being run on a tablet-sized device with much more modest memory capacity than larger consoles or PCs there seem to be no compromises in sight. The only edge would go to the PC version for its readily-available mod support that can help you alter the game in some substantial ways, but in the case of the Switch the ability to play it anywhere in style more than offsets that sacrifice and even arguably makes it a superior version to the other consoles. 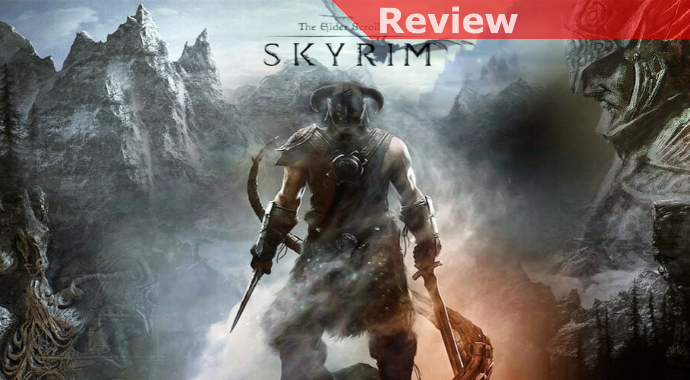 Despite its age Skyrim is just as rich and robust a game experience as it ever was, and the fact that it can be played on a portable device is a technical achievement worthy of some praise. Congratulations to the team at Nintendo for making versatile hardware capable of this feat and to Bethesda for having both the vision and expertise to pull this off and to set the bar so high for the other major publishers.